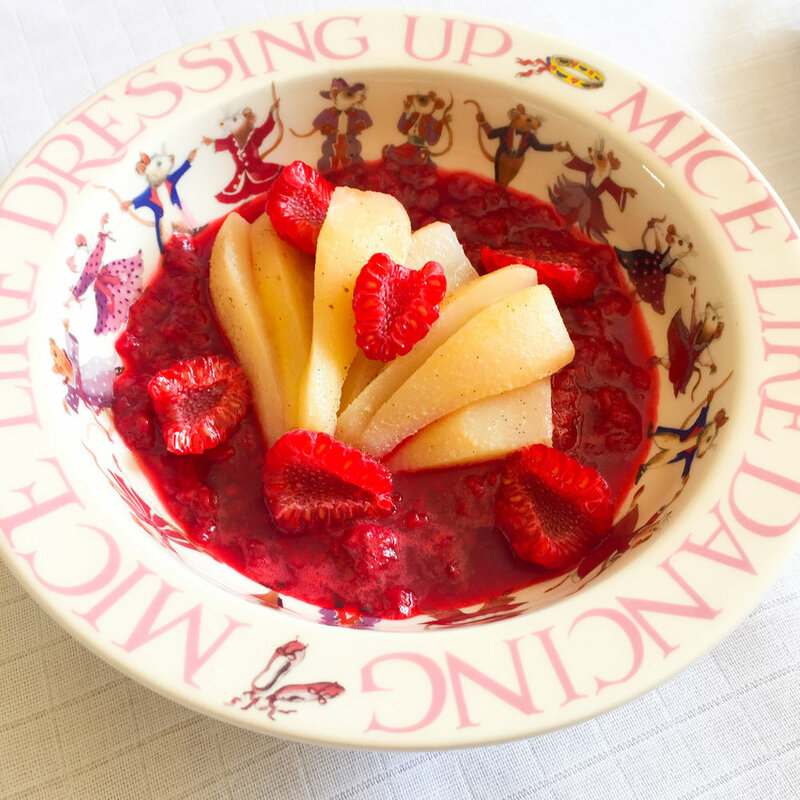 Poached fruit is delicious for breakfast and a reminder of my childhood. It's a great way of using up fruits that might not be at their best. I poach the pears in water with a little vanilla. You can serve them straight away, cutting the fruit off the core for smaller children. For older children make a homemade raspberry sauce, or chocolate sauce, for extra deliciousness! In a pan big enough to hold the pears snugly, add the vanilla pod and lemon zest. Half fill the pan with water and bring to the boil. Simmer for 5-10 mins to infuse the water with the vanilla and lemon flavour. Next add the pears, cover and gently poach for about 30 mins until soft. I test the pears at their base with a skewer, the pear should be soft and cooked. Turn off the heat and set aside. The pears can be poached up to 2 days ahead and kept in the poaching syrup in the fridge. Homemade chocolate sauce (contains dairy), just melt the chocolate in a bowl over water gently. Adding a splash of milk and a knob of butter.